Three months of Bible readings to help you investigate John's Gospel, King Solomon and the fiery prophet Elijah. 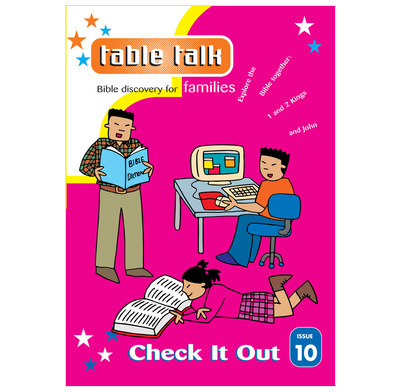 Issue Ten of Table Talk is called Check It Out. Three months of Bible readings to help you investigate who Jesus is in John's Gospel, find out about King Solomon in the book of 1 Kings, and meet the fiery prophet Elijah (God's Messenger) in 1 and 2 Kings.